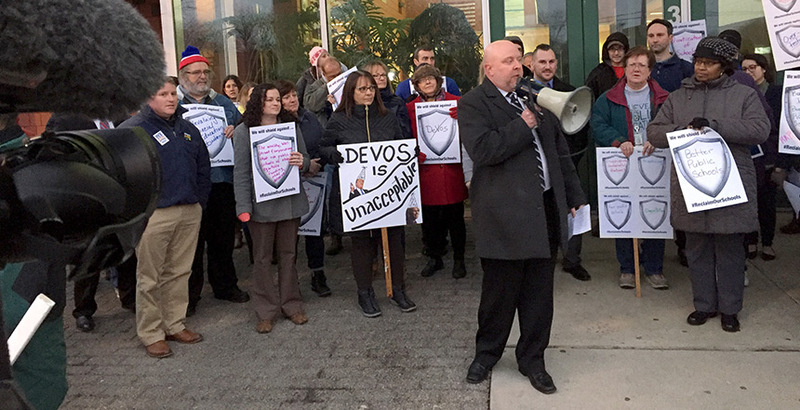 Nearly 100 people representing at least a dozen NYSUT local unions, parents, students, labor leaders, religious leaders, civic leaders and community members huddled together in the cold evening air outside Rochester’s School Without Walls Thursday. In chants and speeches, and on signs and shields, they called for access to a high-quality public education for every student and stood up against the Trump-DeVos political agenda. They sent a clear message to the new Trump administration that any attempt to privatize, demonize, supplant or divest in public education will be met with resistance. Full story from NYSUT here.